Fans of Better Than Ezra have new music to look forward to. The band, Kevin Griffin (vocals, guitar), Tom Drummond (bass) and Michael Jerome (drums) will release their new album Paper Empire on May 12. 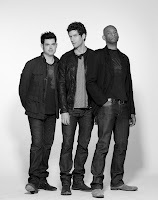 For those in the New York area, Better Than Ezra will be at Irving Plaza on June 19. Download the single "Absolutely Still" from the upcoming album.